The New ME Diet was created by brothers, Jade and Keoni Teta, who are both holistic physicians, biochemists and certified personal trainers. In their book they aim to help dieters understand their hormones and how to create hormonal balance to support better energy and weight loss. The Teta brothers concentrate on the importance of losing fat rather than muscle because “muscle releases hormones and is a catalyst by which you can release your own hormones, like growth hormone and testosterone”. Their goal is to help you turn your body into a “fat-burning machine” by giving your metabolism a kick-start through a customized diet and fitness program. One of the major concepts in The New ME Diet is what is called the ‘metabolic effect’, which is identified as “the optimal state of hormonal function that leads to sustained fat loss and health”. This can be stimulated by adjusting your diet, supplement and fitness regime to suit your unique metabolism. At the beginning of the book you undertake a questionnaire to determine if you’re a sugar burner, muscle burner, mixed burner or fat burner. Depending on your result you will be provided with specific dietary and fitness advice to suit your metabolic type. For each of the metabolic types you can eat unlimited amounts of certain foods including most fruits and vegetables, lean proteins, whole grains and legumes but the amounts of sugars, fat and starches that are permitted will vary. The basic structure of The New ME diet involves eating five or six meals a day, which helps to stave off hunger and cravings. Dieters are also permitted one reward meal each week. The book includes a basic meal plan as well as muscle-building recipes. Apart from diet and exercise other lifestyle factors can affect your metabolism and some of these are addressed in the book including sleep, light and dark exposure, stress and alcohol consumption. Fruit, vegetables, whole grains, legumes, lean poultry lean beef, fish, egg whites, almonds, peanut butter, coconut, olive oil, whey protein, non-fat yogurt. The book includes the ‘Metabolic Spark Workout’, which involves a combination of interval training and weight training. Interval training stimulates hormones and increases your rate of calorie burning while weight training assists with the production of hormones and lean muscle. The exercise program involves only 30 minutes of exercise, three times a week but dieters are also advised to walk for 30 to 60 minutes each day. Each metabolic type is provided with a different exercise plan. The New Me Diet: Eat More, Work Out Less, and Actually Lose Weight While You Rest retails at $25.99. Encourages the intake of a wide variety of whole foods. Provides unique information about balancing hormones. Concepts of the program are based on scientific research. Authors are qualified health professionals. Exercise routines are time efficient but also effective. Reward meals can alleviate the psychological pressure of long-term dieting. Some dieters may prefer not to eat six meals a day. Will require time to be spent on meal planning and preparation. 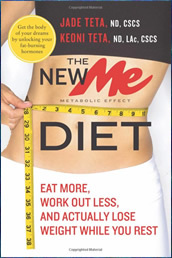 The New ME Diet involves a combination of nutrition, fitness and lifestyle adjustments that is customized to suit individual variations in metabolism. This program offers a very complete and balanced plan that will assist dieters to lose weight effectively as well as improve general health by balancing hormone levels.